Of the three brothers who volunteered for Kitchener’s New Armies in 1914, Arthur left us the most remarkable story in his letters. When he enlisted, he was fourteen months under the minimum age. He had suffered since childhood from impaired hearing. Although he began in the army alongside Ned in the 9th Battalion, he was transferred to the 3rd, a reserve battalion, and then served overseas with the 4th and then the 1st battalions. To be moved from one battalion to another was unusual enough, but after briefly serving in France he was then redeployed via Egypt to Salonika, in the Greek province of Macedonia, with the 1st Battalion. He had some problems with military discipline and spent many days CB (Confined to Barracks), sometimes (but not always) failing to hear an order. His Service Record which has more or less survived shows that he did not always admit in his letters to these generally trivial offences, though in France he swore at an NCO who was not deaf. He was demanding of his mother, whether for darned socks, a postal order, or, as she must occasionally have felt, her patience and understanding. He evidently read a national newspaper and questioned whether neutral countries would join the war. In March 1916 he was sensitive to the fact that the war still drags on with terrible loss of life on both sides. From his letters we learn a lot about what happened to him and how he felt about it, but he gave little descriptive account of the places he went to. He had fine handwriting, preferably using one of the two fountain pens he was given. And, most remarkably of all, he fell in love. Arthur enlisted on Tuesday 15 September, after he had sold his pigs at Ipswich market. Perhaps he went to Ipswich that day intending to enlist, or decided to do so when he got there. What is certain is that his mother did not approve, and almost certainly he had said nothing to her about it before he went. The first postcard must have been a shock. I am writing to tell you where I am, am in the Ranelagh Road school and I think I shall stop here all this week. I slept in a room with about fifteen more last night, and all they done till about 1 o’clock was laugh and talk. My pigs sold well as Ned told you, ask father to settle with Nunn, the bills are in that box on the drawers upstairs and 25s [£1-25p] too. I think I owe Nunn about four guineas [£4-4s, £4-20p]. I sent father’s watch by H.Foulger and told him to tell you I had enlisted, and could not get home last night. I passed the doctor quite easily, and I will come home on Saturday if I get chance. It was not only Joe and Etta who had a shock. Ned wrote home to say that Arthur was in a stew because they would not let him come home, nor it seems did he get much sleep the first night, though he probably did get home at the week-end. The bills owing to Nunn were no doubt for getting the pigs to market; Henry Foulger was killed in France while serving with the Essex Regt. in 1917. Arthur probably reached Shoreham on 21 September, two days after Ned. His next letter (c. 1 Oct 14) may have been his first full letter home. He was now 15103 Pte. A Goodchild, A Coy. 9th Battalion, Suffolk Regt. Like Ned he was one of sixteen crammed in a tent, where he found that half the others were ex-soldiers. He evidently had mixed feelings. He reported a rumour that they would be moved to Yarmouth: I don’t know if it is right but I hope it is for I should be a little nearer home, for after all I wish I had not come into this. He also told his mother that some were being discharged, presumably on medical grounds, but I do not think they will discharge me. I should not care if they did. But he also wrote that I feel sorry for you at home, you must be lonely but don’t worry about me for I can look after myself. He met up with Harold Broom, who told me he did not like it the first time he saw me but I don’t mind it and Ned say he like it … (Sgt. Broom from Woodbridge, was killed in 1916 aged 20). All this week we have been for a route march every morning before breakfast. I like that better than drilling. We have got some old rifles and are learning to handle them, but we are not going to shoot with them. The huge numbers of men at the camp must have been hard to get used to. There are nearly 20,000 soldiers here, and in the town last night there was the most people that ever I saw in my life. Every shop and pub was full and outside was just the same. I could not hardly move sometimes. I started from the camp with Ned and Sutton but I lost them as soon as I got into the town. He enjoyed a swim down on the beach. The army still frowned on cigarettes at this stage of the war: I bought a pipe but I can’t stick to it, so am sending it home for father. During the Boer War, enteric fever (typhoid and paratyphoid) claimed many victims, but by 1914 a vaccine had been developed. The annual incidence of enteric infection in South Africa had been 105 per 1,000, with the annual death rate 14.6 per 1,000. During the First World War these rates fell to 2.35 and 0.139 respectively, and inoculation must have been the primary factor responsible. Surprisingly, inoculation appears not to have been compulsory, though presumably you needed a good reason not to receive it. Arthur reported that We are not forced to be inoculated but I am going to be done and so is Ned, Sutton and Stanley Clarke. George warned him (10 Oct 14) that the second time is worse than the first. I hope it is not much worse for the first was bad enough. My arm was useless for two days. In spite of inoculation Sutton contracted the fever a year later in France. On 10 October Arthur reported that he had a uniform, a blue one with black buttons and a red stripe on the cap, and food was plentiful: there’s 14 in our tent now and we have 7 loaves of bread a day, plenty of cheese, butter and jam. We have hot sausages for breakfast, sometimes bacon. We have hot beef and potatoes for dinner. We have not had a cold dinner only once, and that was when we come from Ipswich. We had some good cake last Sunday for tea, and I always have all the tea I can drink … I never buy no food in the town of a night, but I have some before I go to bed and when I wake up too. He weighed himself (11st 1 lb 8 oz, a stone more than Ned), and he and two others found a way of keeping warm at night: I used to lay one of my blankets down and cover myself up with the other, and I used to wake up as cold as ice. But now three of us put our blankets together, lay two down and cover ourselves up with four, and it’s just as warm as a bed then. A few days later they were each issued with a third blanket. In mid-October he made the first mention of his deafness, making light of the problem. I meant to have told in my first letter that I get on quite well about hearing for I knew you would wonder about me. They have noticed me in my tent, but they say the same as Peter Harris did, they say I hear when I like. They took me to be stupid at first, but after a week they said my old head was screwed on right and so it is. They have not noticed me in the ranks for they all speak plain. I have had several messages whispered to me to pass along and have heard them the first time, so I know I shall get on alright about that so don’t worry. But he was perhaps wondering about his fitness for active service: I will not volunteer for any service abroad or anything of the kind. I don’t intend to go out of England, but I may be forced, for I can see a very serious time coming for our country. I have not seen any Belgian refugees but I’ve heard there are some at Folkestone and Brighton. I feel sorry for the poor people, their country is ruined sure enough. The autumn rain had started (where there used to be five inches of dust there is half a foot of mud now), but in general morale was still good: I didn’t come here with the intention of liking the drill, but it’s better than hard work. The way to get on is to do what you are told … I often go to Ned’s tent and talk to him, he never grumble, we are both as happy as the days are long. A few days later the two of them with Sutton had their photo taken in Brighton. Arthur’s hearing quickly became an issue. They were calling out names for kitbags on Saturday and I didn’t hear mine the first time, they called it the second and then the sergeant asked me if I was deaf and I told him no. I should have heard only I was looking round the other way with my right ear to him. They have noticed me more in my tent too. I believe I shall get my discharge but I am not sure. I shall not mind if I do and I don’t expect you will either (19 Oct 14). But he immediately regretted raising his mother’s hopes. I don’t think I shall get discharged after all. I never ought to have told you anything about it … The day after I got your postcard, saying you would like me to come home, I went to the orderly Corporal of A Company and told him I was a little deaf, so I had to go to the doctor’s tent. They syringed my right ear and tested my hearing with a watch, but the syringing didn’t do any good, and they asked me if ever I had been sent off parade. I hadn’t, so I had to tell them no. When I came out they gave me a paper, it said on it (Medical Duty) that meant if I didn’t get any worse I was fit for the service. I asked the Corporal in our tent if he thought I would get discharged, he said no, they won’t discharge such a chap as you. You are sound everywhere except your hearing, and you are only slightly deaf. They are more particular about eyesight and our feet and legs. There has been nearly 20 discharged in A Company for that. I know one way how I could get out of it, by playing the fool, but I shan’t do that for I should have to go through a lot of trouble and then get a bad character. I suppose I shall have to stick to it, and make the best of it, same as I always have done (c.24 Oct 14). Meanwhile the rainwater had started to run through the tent, and he observed the huts being built with the eye of a future builder but without enthusiasm: I don’t think we shall ever go in these huts. The mud was further churned up by all the construction work. There were 9 or 10 traction engines going for nearly a fortnight, Sundays and all, so were the carpenters at work on Sunday, there are fifty or sixty horses still carting wood and about 300 men employed on the building. It’s being done by a contractor from London. But letters from home were a great comfort, I like your letters, I read them through and through. I’ve read the last one at least 8 times … What kind of hand am I at writing letters, I have not been used to it (c.15 Oct 14). Hilda, six years old, was evidently worried about the impact of the war on her young life, and she received reassurance of a kind: Tell Hilda Santa Claus is not at the war, he is going to stop at home. That wouldn’t do to get him killed, she wouldn’t have anything for Christmas (c.24 Oct 14). George came home to Grundisburgh on a week-end pass towards the end of October. Does he look well, he can’t look much better than what Ned and me do. I feel strong and well, the army is making a man of me. 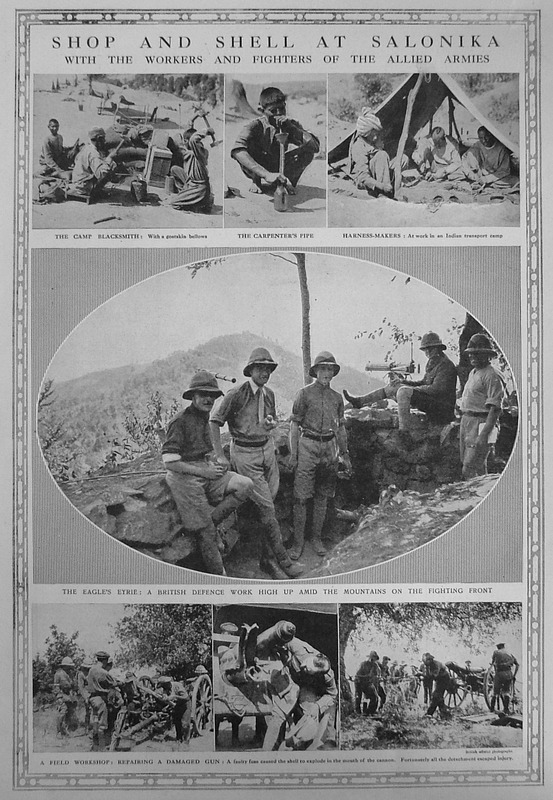 I have learnt what rough life is, I shan’t know how to feel when I sleep in a bed again and have my meals off a table … I have got used to the men in our tent, they seem like old friends now (28 Oct 14). Last Friday the whole Sffk Batt went for a route march, we went towards Chichester about eleven miles there and back. I like route marches for we see about the country and it’s a nice change for us, they tell us to sing … “Tipperary” is the favourite… I expect the people at Shoreham and round about feel as safe as can be, for the Sffk Batt alone is nearly ¾ of a mile long, four deep. I expect they think Germany could never conquer England, well, we know they can’t, but there will be a rare hard struggle and a lot of lives lost, for Germany won’t give up yet. They have got it into their heads that they can crush England, but they will never do that, well, at least we hope not, we must all do our best for the honour of country. But still he regretted mentioning the possibility of a discharge, I was very silly to do such a thing. On 3 November he wrote his longest letter, no less than 1700 words. He looked forward to letters from home (This last letter is just the sort of letter I like. I read it through 3 or 4 times as soon as I got it and I hope you will write me like it every week), and in exercising his new skill he was beginning to reveal his emotional, impulsive side. He had fond words as well as sweets for his young sister: So Hilda cheek your lodger, I expect she think, though his name is Arthur, he does not take the place of me. It is dangerous about the roads now. Take care of Hilda for I shouldn’t like to hear that she was hurt. She is the one I miss most of all of you, I long to see her again and hear her voice. I miss her pretty little face. He had just spent 24 hours on sentry duty, two hours on and four off but no sleep allowed all night. It’s the same here as George say, you are soon in the wrong, you have to be very careful what you say or do. I soon found that out the first week I was here. I done something wrong (I won’t tell you what it was) and I got 5 nights [C.B. ], that is, I had to go to the police tent and answer my name 5 times every night at 6,7,8,9 and 10. I was not allowed to leave the camp. I was glad when that was over. I have been very careful since. Five days was quite severe for a first offence and he was perhaps fortunate if he escaped punishment for another episode: There are some rough fellows but they won’t scare me. As you know, my left big toe nail grew in. One Sunday morning [25 October] before 7 o’clock I was going to clip it out, so I lit the candle for it was not quite light, one man (an old soldier) blew it out, he said I didn’t want to burn the candle when it was daylight. I got a piece of my own out of my pocket and lit that, another chap threw a towel over it and put it out. I picked the candle up and threw it at his head and hit him. He got up to strike me but I was ready for him and struck him and knocked him to the other side of the tent. The bottom of the tent was rolled up so when he got up he was outside. He walked round slowly to [the] opening and never said another word, but during the day I noticed him cast several dark looks at me. It was that wet Sunday night and I went to sleep in the recreation tent. He came too and asked me if I would share my blankets with him. I said yes so we slept together that night and he’s alright to me now. We go out together sometimes now, that’s the only row I have had with anyone up till now. In the same letter he said he was told off for appearing on parade unshaven, and three days later he admitted I have been absent sometimes but didn’t happen to get found out [6 Nov 14]. Unlike Ned who was distinctly cautious about aircraft, Arthur decided to take a closer look at the activity at Shoreham airfield, which had opened in 1911 as Britain’s first commercial field. The aeroplanes hadn’t been up lately until today, the weather hadn’t been good enough, but this afternoon they have been going up into the clouds, out of sight. We could hear them, they make a lot of noise just like a motor. I forget if I told you I had been close to them when they start and helped to pull them out of the shed. They are not at all heavy, they are made of wire, thin splines of wood and canvas, and the engine is at the front. The men are not strapped in them as I thought but sit in a long tin box with just their heads out. Sometimes two go up at a time. It’s a funny thing when they start, they nearly blow you down. They move a crowd of people back a yard. I know it’s right because I have stood by the side of them myself. When they start they run along the ground for about a 100 yards at about 80 miles an hour and then begin to rise as steady as a bird. They are wonderful things if one come to think about them. The ones who fly these are brothers [Eric and Cecil Pashley], there’s two of them but 15 aeroplanes. For the week-end 21-22 November Arthur managed to get a pass to get home. I shall come alone, I can look after myself alright through London, don’t worry (19 Nov 14). But unfortunately he failed to get back until the Monday. I got off light about being absent yesterday. I had to go before the Captain and I told him I couldn’t get a train back on Sunday afternoon. He said I should have to lose one day’s pay. I shan’t mind losing a day’s pay, it’s a lot better than reporting myself 5 times a night. However, the fine was cancelled: I have not got to lose a day’s pay for being absent now, the Captain looked at the timetables and found that no train ran from Bealings on Sunday afternoon so I couldn’t get back, but I didn’t know nothing about the trains on Sunday, and didn’t care did I? It was my first offence of being absent (27 Nov 14). Even so, his week-end ticket was not valid on the 23rd and he had to pay one-third more so the total rail fare was 9/8 (48p), more than his army pay for the week of 7 shillings. Out of the 7/-, 3½d was deducted for laundry, but one week his clothes seemed not to have been washed at all so he began sending his dirty laundry home. He decided to save 2/6 a week, sending it home as a postal order. He ended his letter on 3 December saying I have wrote this in Southwick Town Hall, it is open to all soldiers as a reading and writing and recreation room, and there is a concert in here every night. Young women come and sing to us and there is a good gramophone too, it’s been playing nearly all the time I have been writing, but I don’t think I have made many mistakes. Two significant points here: that he was anxious not to make mistakes in his writing; and was Dolly one of the young women who sang to the troops? Somewhere, perhaps in the YMCA or the Recreation hut at the camp, or more probably now in Southwick Town Hall, Arthur had access to national news. On 16 December: Have you seen today’s paper? In one paper I saw that the Germans have been shelling Hartlepool and Scarborough this morning, and that a big naval battle was expected. Our fleet have been doing well lately haven’t they? But our people will do the Germans on the water, their navy can’t touch ours. I have seen several big ships go along the Channel today but we couldn’t see what they were for they were a long way out. I have not heard for certain when I am coming home [on Christmas leave; Ned was at Grundisburgh in mid-December enjoying his] for things are so unsettled now … our country is in a very unsettled state from the biggest town down to the smallest village. Two or three days later he wrote again about the shelling of the coastal towns. I think it was a foolish and cowardly thing, killing innocent women and others, and as soon as they caught sight of our ships slipped off. They are afraid to fight our navy fair but I don’t think they will get so close to our coast any more, our ships will be more on the alert. They don’t seem to be getting on very fast with the war. It looks like lasting a long time. Our people have gained ground in places and lost it in others. They don’t seem to me to be any forwarder than they were four months ago, but I hope there will soon be a change for the better. I don’t think Italy and USA will be able to remain neutral no longer than February, and I saw in a paper that Norway Sweden and Denmark are going to have their Ministers of War meet on the 21st of this month (c.18-19 Dec 14). It may well be that these opinions were those of the newspapers that he read, but it is notable that he wanted to discuss larger issues with his mother. On the ‘domestic’ front there was good news and bad. I am back with my platoon again away from the recruits, but am prisoner in my hut today for being absent, so shan’t be able to post my washing tonight. Nor would he be sending money, I can’t spare it this week. It does seem that there was now a new claim on his time and money. He completed the letter on 19 December with the best news: We have moved to Brighton, we came by train from Shoreham, Ned is here too, he got back [from his Christmas leave] last night quite safe. They were out of Shoreham’s poorly-constructed huts, in Arthur’s case almost permanently. For the rest of his training period on the south coast until the last five days he would be billeted on Mrs Cooper at 78 Rose Hill Terrace, London Road, Brighton. After the flurry of letters in December there is nothing surviving from the Christmas period after which he was at home on post-Christmas leave. The next we have is a card on 2 January 1915 to say he was safely back. I had to wait an hour at Bealings, but there were a lot of my mates on that train. The delay was probably due to a serious accident at Ilford the previous day. I saw the wrecked carriages as we went through. I think there were ten killed … As a postscript to that, that Ilford train smash has been shown in the picture houses here. I saw it last Wednesday night, it’s wonderful how quick they do it (11 Jan 15). And he had another excitement to report: I saw the King and Queen on Saturday, they came here to visit the Indian wounded, there are several 1,000 wounded here now. We (the Suffolk Regt) had to stand up one side of the street to keep the crowd of people back, and mounted police kept them back the other side. We had to stand there nearly an hour waiting for him. I don’t know if Ned saw him … There are a lot of Indians here now, nearly recovered from their wounds. Some can speak a little English. I have spoken to some of them, they seem very pleased to be here, and it’s very amusing to hear some of them talk. On 15 January there are a lot more Indians here now and some have nearly got over their wounds and will soon be off to the front again I expect. Like Ned, Arthur was fascinated by the strangeness of the Indian troops, though six days later the strangeness was diminishing. We get quite used to the Indians, they are allowed to go about by themselves now, they dress in their native clothes, wrappers round their heads, some have never had their haircut nor a shave yet, they all look like brothers. Inevitably the pace of military training slowed down while the battalion was in billets, and the coherence of the battalion as a unit must also have been affected. We had Battalion drill again last Tuesday on Holingbury Park, but we (A company) mostly parade on Preston Park, it is not so large as the former. Arthur in fact admitted on 15 January that he did not know where Ned’s C Company paraded for drill. We have not been firing lately, but are training very sharp in the bayonet fighting. We parade five hours a day on the average, and still have Saturday afternoons off. He was very anxious to shed his blue uniform and get kitted out in the long-promised military khaki, so that he could present himself properly ─ not least to a photographer ─ as a soldier. There were occasional field days, and it was probably on one of those that he collected another three days CB for disobeying an order …for not laying down when a Corporal told me to (5and 9 Feb 15). Live firing on the range resumed in mid-February, I am one of the best shots in the Company, if not the best of the lot (19 Feb 15). Arthur made no particular comment in his first (surviving) letters from Rose Hill Terrace on how he liked his billet and on Brighton, but there is no doubt he enjoyed being there. We are very comfortable here and I hope to remain here some time. Brighton is a very fine place and there’s something fresh to see every day (15 Jan 15). On 21 January, while Ned was reluctantly road-building back at Shoreham, Arthur was starting to believe his luck. I hope I don’t get sent back to Shoreham, I am very comfortable and happy here. I know my way nearly all over the town now. A week later, there is plenty of amusement about here, I went to a play last Friday night. I had a shilling ticket given me and last night I went to a concert, I had a 2s ticket given me for that;and on 2 February I dare say my turn will come in time to go back to Shoreham … I shall miss the comforts of Brighton very much when we go away, it’s such a happy place. Two weeks later, I have had a very happy and comfortable time at Brighton and will be sorry when we go away … There is another concert in the Stanford Road hospital on Saturday evening. I have got the chance to go there if like, but have got another appointment so shan’t trouble about it. Another appointment? Clearly Arthur had more than one set of friends. But in the house there was friction involving some of the other men. I like Mrs Cooper very much, but she is easily put in a temper. She has not lost her temper with me, but she has with one of the others, that chap Smith, she never has liked him. He is ill-behaved at the meal table, she says, they are very clean and respectable people and take in visitors in the summer. The trouble came to a head on 6 March. There has been a disturbance in our billet this last week. Tom Freer has insulted Mrs Cooper, and has stayed out late at night when she asked him not (and she reported him for it). We all had to go before the Major yesterday, and Tom Freer got 5 days C.B. and us others got 2 days C.B. Mrs Cooper is rather a hot-tempered woman and she’s very excitable, and she said she wouldn’t put up with it for another week, but she was sorry to bring us all in to it. I won’t tell you all the details about it as it is rather a long story. Mrs Cooper also became involved in the issue of Arthur’s deafness and indirectly therefore in his transfer out of the 9th battalion. Almost certainly there were more letters from Arthur than we now have; his deafness had not been mentioned for nearly four months when on 19 February he remarked out of the blue They haven’t made me hear any better, but I don’t think they will send me “sick” any more. It appears that Mrs Cooper had mentioned Arthur’s disability to the Army, probably when she complained about the soldiers’ behaviour in her house. It appears also that Etta had written to Mrs Cooper probably to ask what was going on. Mrs Cooper replied in an emotional letter on 4 March to tell you not to worry about Arthur, but I am afraid I must tell you that I think it was through me that they commenced on his ears, but Arthur knows I done it with the best of intentions, as I found the poor boy was always getting punished in some way or other for every little trifling thing he done … I thought if they knew he was deaf they would make allowances for him … but you need not worry any more as I told him if he was my son I should not allow an operation and I was sure you would not allow one either, and I told him to be firm and not let them persuade him to be operated on, so it has all passed over. She confirmed that my children and I would take him out to concerts with us and picture palaces, and they [the other soldiers] have been jealous of him all the time, but she felt that it had all turned out well. I think he will soon get his discharge, if not, be transferred to another regiment … He will never go to the front, only at home in England, owing to his deafness, so I have done a little good for him after all. Arthur sent an account of his dealings with the medical authorities on 2 March. They want to operate on me tomorrow mother, but I refuse to let them, one doctor says there is something in my ear and it’s got to come out and an operation is necessary. Was there anything put in my ear when I was operated on before? The doctor put an instrument in my ear and scratched something, it is hard, I wondered if it was put in my ear for some reason when the other operation was performed. I am writing to ask if you agree to me being operated on. I am not willing myself and I don’t think you will be either. I will copy the note what one doctor sent from one hospital to the other, it is as follows: “this man has a [?concoction] or foreign body in his ear. He must be kept in and operated on. Will you send him up tomorrow to be admitted.” Write back as soon as you can mother, I am afraid that the thing the doctor scratched is something that was put in my ear when I was little. He ended the letter with two PSs, only the first of which was reassuring: I am making the worst of my hearing, when I do hear what they say I don’t take any notice. I hope I shall get discharged. Secondly, This doctor is a young fellow and I think he wants to experiment on me. It seems that the Army was forced to back down on the proposed surgery, though not with a good grace. Arthur was cheerful at first. He wrote on Saturday 6 March to say I have been to the hospital this morning (and I told them that there is no cure for my deafness) and have got to go again on Monday. I think that will be the last time as we are going back to Shoreham on Wednesday. I will let you know as soon as possible about me getting discharged … I am having an easy time through them doctoring me. I haven’t been on parade for 8 days. I just go to the hospital in the morning and then for the rest of the day I go where I like. But on Wednesday 10th, he returned with the rest of the 9th battalion to Shoreham camp to be greeted by two pieces of bad news. Firstly, although on the face of it this looks more like good news (his mother would certainly have thought so), I am leaving this battalion on Monday [15th], to come to Suffolk to join the 3rd battalion as I am only fit for home service. I think the 3rd is stationed at Felixstowe, so I shan’t be very far from home. Secondly, I got into trouble for refusing to go into the hospital, I got 5 days C.B. I don’t finish it before Saturday night, so I shall only have one more day at liberty here. I can’t write much, as I seem rather down-hearted (which must have been a huge under-statement). On the 13th he wrote to say I finish my C.B. tomorrow night and shall be glad of it, for I have to do pack drill for an hour every night and that’s not a nice job, and he added that he would be going to Brighton the next day to say goodbye to Mrs Cooper and all of them and another friend of mine. As a final kick in the teeth, they have all got khaki here now, I should have mine if I hadn’t been coming into the 3rd Batt. For all parties (except his mother!) this was an unhappy situation. The 3rd Battalion was a Special Reserve unit whose function was essentially to deliver drafts of men to replace losses sustained by the Service battalions on the western front and elsewhere. Men joining the 3rd were either recruits, or men (like George 12 months later) recovering from wounds, or like Arthur who was deemed ─ or believed he had been deemed ─ only fit for home service and could therefore not remain in the 9th. 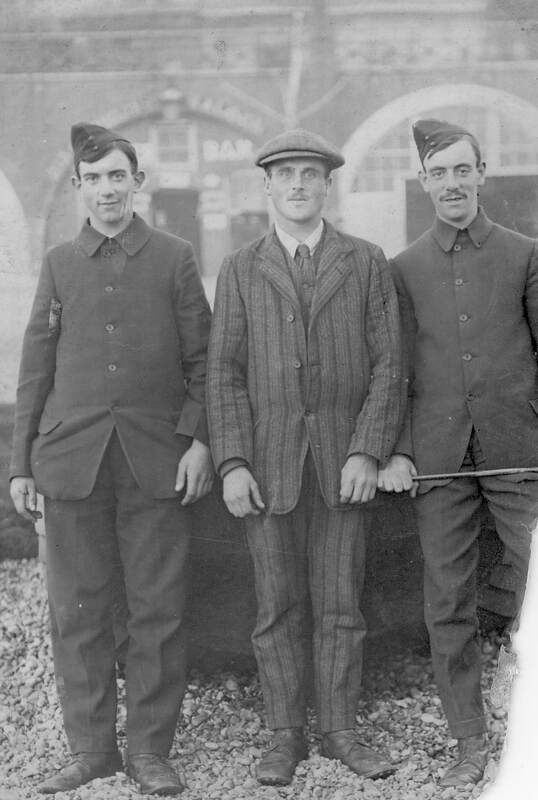 For George and soon for Arthur, and doubtless for many others, being at Felixstowe must have been a strain with the constant uncertainty of whether and when they would be sent (in George’s case sent back) to the front. Arthur’s transfer to the 3rd Battalion may also have been due to an indifferent disciplinary record (though it is impossible to know how many days C.B. the average soldier would have collected in six months). The reason why he was so despondent at leaving Brighton was only revealed to his mother after he reached Felixstowe: as well as the care and comforts of 78 Rose Hill Terrace, he was leaving behind Dolly ─ another friend of mine ─ for whom he had fallen heavily. As Ned relates, Arthur went by train to Brighton on 14 March and the two brothers and Sutton met up at Rose Hill Terrace. “The landlady told us he was her best boy, and was sorry that he was going away, she told us that Arthur kissed them all before he went, and he is pleased he is going into the 3rd Batt”. No doubt he spent as much as possible of the rest of the day with Dolly. The following day he moved to D Coy. 3rd Battalion Suffolk Regt., at Felixstowe. Arthur was at Felixstowe nearly five months, and it was an unhappy time. He missed Brighton, and there was fluctuating uncertainty over where he would be posted next. Reconstructing what happened is not always clear because many of his letters and cards were not dated. His immediate problems were financial however. Dear Mother, I have got to Felixstowe alright. Will you please send me 2s [shillings, at once as I have spent out. Arthur. His next card, a few days later, was even more to the point. Dear Mother, Haven’t you got that card I sent on Monday asking you to send me 2s, if you did get it why haven’t you sent the money, I sent a letter to Brighton the same night, and had a letter back from the girl today, so I ought to have got the money today (if you sent it). I wanted it more than a little, I haven’t had a penny all the week. Arthur. Two points are worth noting from this card: one is that in spite of the curt tone, it is in fact his own money he is demanding. Etta acted as effectively a banker to all her sons, and Arthur had at least £8 in his ‘account’ at this time. Even so, every time cash was requested she would have to go down to the village to get a postal order from the post office. The second is that his reference to ‘the girl’ was probably inadvertent, and not repeated for a week or two. He received his money the following day, probably the 20th, and explained (but not really) how he came to be short: I lost all my money at Shoreham through my foolishness. But he was feeling better ─ I have got khaki now, I had it the day after I came here, and I have got my equipment, rifle, and 150 rounds of ammunition ─ and closed With love from your affectionate Arthur. Now he looked and felt like a soldier he had his photograph taken, as most men did. On 26 March he declared that I am going to save more money as I have been rather careless lately and sent home 5/6, 6d for postage of his washing and 5/- to his ‘account’. In the same letter he explained I am alright here, but not so happy as I was in Sussex. I left a lot of friends there, I have none here … Even on 3 June he still felt I haven’t any particular friend here. 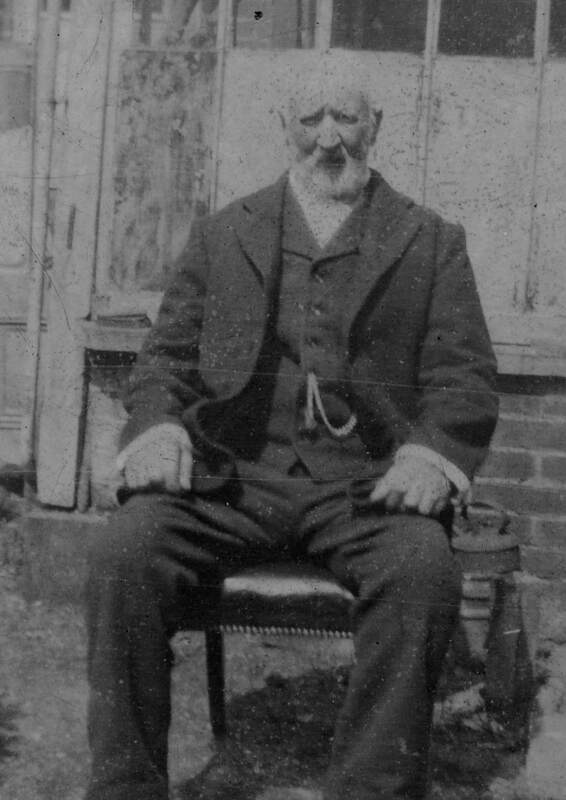 Jack Smith, Sutton’s brother from Hawes Farm across the road from The Fens, probably enlisted in early 1915 and was posted to Felixstowe in June. 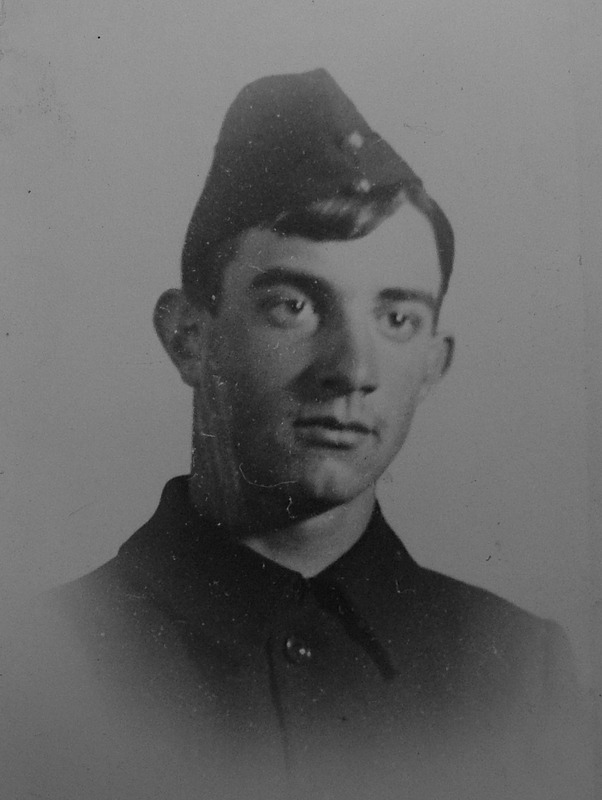 I am very glad Jack S has come down here, as I can go out with him … But on 19 June Jack Smith and George Lankester (from Half Moon Lane in Grundisburgh) were transferred to the Royal Field Artillery. Training for the artillery was much shorter than for infantry, and Jack was killed in France in October 1915. At the end of March he opened up to his mother. So you think I look serious on my photo, I have sent two to a girl at Brighton, she likes them and says I look nice. I might as well tell you the truth, it was leaving her that made me so sorry and unhappy last week, but I am getting alright again now, but I shall never, never forget that girl, perhaps Mrs Cooper told you about it (I have sent her my photo). You needn’t tell father and Cecil what I have said in this letter, don’t let them know you have had it … And in a PS I feel I must tell you everything. Perhaps he felt he had told her everything, because there is no more mention of her until May. On dates which are impossible to determine (undated letters) but probably 5-7 May Arthur went back to Brighton and stayed two nights with Mrs Cooper, who did not charge him for the stay and indeed called herself “your Brighton Mother” (11 April 15). She in turn wrote to Etta on the 9th “I hope you don’t think I enticed Arthur to come down here. I told him he ought to stop with you, that you came first before anybody. But he said you did not mind”. On about 13th May Arthur wrote home to say I am so glad I went to B’ton, I went to Dolly’s to tea Thursday night and saw her mother and father, they are nice people. This was the first time he had mentioned Dolly’s name. On the 21st he added I find time to write to Dolly … and always shall as long as I am away from her. I forgot if I told you that I went to hers to tea on the Thursday night that I was there, I could have done with more than two days down there as I didn’t see all the people I should have liked to then. I went out with Dolly the Wednesday that I went down there, when I went home to Mrs Cooper’s to tea she said “Why didn’t you bring Dolly to tea” and some more people (friends of Dolly’s) told Dolly to “be sure and bring Arthur in to tea”, and her mother wanted to see me too, and we ourselves (Dolly and me) wanted to go out into the country and take our tea. We learn later that she was born on 22 June 1896, so she was just five months older than Arthur, but her surname is never mentioned. She is quite a lady mother, and it’s a fine house they live in… Dolly has two sisters and two brothers, one sister married and a brother married, one sister at home and one brother in the Sussex Regt. (14 July 15). There must have been times when his mother’s patience was tested. When he had a pass for those few days in early May he was only briefly at home before going to Brighton, to the embarrassment of Mrs Cooper (“I told him he ought to stop with you”). He bought a Suffolk Regiment brooch for Dolly’s birthday but I have altered my mind and sent the brooch to you, I will get Dolly something better than that … Will you send [Mrs Cooper] some more flowers? I promised her you would, and tell me what the postage cost, and I will send the money. When Mrs Cooper writes she calls me “My dear boy” or “My dear Arthur” and Dolly calls me “My dear Arthur” too, and so do you, so I suppose I belong to all three of you (29 May 15). Mrs Cooper wrote to Grundisburgh in June thanking Etta for the box of roses (“so refreshing … a little glimpse of the country”), and perhaps in answer to a question from Etta told what she knew of Dolly. “I have never spoken to her, I only saw her once at a distance, but I should say she was a very good girl, as I have seen her name in the papers singing for charitable purposes.” This was young love, at times embarrassingly expressed ─ he asked his mother to guess what SWAKTTOIL on Dolly’s envelopes meant ─ but of the depth of their feeling for each other there can be no doubt. Shortly before leaving for France in July he visited her again. I went to Dolly’s to tea again, and once to a friend of hers, Dolly’s mother’s told Dolly that she likes me very much…Dolly asked me for your address, so if anything happens to me, and she doesn’t hear from me, she will write to you and enquire if you have heard lately … Dolly has given me some little books with French reading in them. They will be useful to me no doubt. Dolly came onto the platform and watched the train out of sight, and she wrote me a letter as soon as she got home. She said she felt so lonely now I had gone (14 July 15). And she wrote to him regularly while he was away. Arthur had arrived at Felixstowe in mid-March believing he had been classified as unfit for active service. But on 16 April he wrote home with bad news. Mother, you will be surprised no doubt, if I tell you that I am just as likely to get sent to the front as anyone. I didn’t like to tell you before, but I can’t keep it from you any longer, that the day after I came here I was examined by a doctor. He said that there wasn’t but very little the matter with my hearing, that I was fit to go to the front anytime. And let me tell you another thing, I should never have been sent out of the 9th had it not been for Mrs Cooper. One morning she told the orderly officer that I was very deaf (you know that I am not very deaf), and he reported it to the Sergt Major, and that was the reason that he kept his eye on me and “brought me up” for every little thing that I did. I am very sorry that I was sent out of the 9th as I am away from Ned. I am not saying for certain that I shall go to the front, but I think it most likely that I shall go in about 5 weeks time, and I may not get sent at all. He explained the function of the 3rd as a reserve battalion. But remarkably, when Arthur returned from Brighton after staying with Mrs Cooper and seeing Dolly, probably on 7 May, he scribbled a hasty postcard to say I am back at here alright, I am not going to the front after all, you have been successful by writing to the officer. And on 10 May he added Wasn’t it a good thing you wrote to Rushbrooke? On about 13 May he thought he knew the explanation: I am not going to the front I am pleased to say, but it’s not because of my deafness, it’s because I am not old enough…The sergt major tells me that I am liable to two years imprisonment for enlisting under age. I have got to go before the colonel on Monday I think, I don’t know how I shall get on, they won’t do much to me I don’t think. But with no expression of concern, he wrote on about 15 May to say I am not going to the front until Nov, Lieut Rushbrooke spoke to me yesterday and told me to tell you not to worry. I am having no punishment for enlisting under age. There can be no surprise that he avoided punishment for enlisting under age since most recruiting stations in 1914 encouraged such volunteers to conceal their true age. Besides, the penalty for false representation at Attestation applied only to marital status, current or previous military service, apprenticeship or imprisonment. As to the encouraging message from Rushbrooke, we can only conclude that Arthur misunderstood ─ more likely did not properly hear ─ what was said, which was merely that his departure to the front was not imminent. With so much turmoil in his life, Arthur could only occasionally write about other matters. He sometimes saw (and eventually spoke to) Mr and Mrs Hardy from the village school whose son Viv, commissioned 2nd Lt, was serving at Felixstowe before being drafted to Ned’s 9th Battalion in France, where he was wounded in April 1916. On 3 June 1915 he asked his mother Is Grandfather and mother alright?, a question which stands out because it seems to be the only reference from any of the brothers to their Goodchild grandparents Henry and Isabella, then living with their daughter Lizzie in Melton. Isabella died in April 1916 and is buried at Grundisburgh, but neither George nor Arthur mentioned their father’s bereavement. On 22 June We went for a march this morning through meadows and across a field of newly-mown clover. The time came back to my mind at once of when I had horse-raked it up, and am sorry I am not going to help to do it again this year … But nostalgia induced by an evocative scent did not mean he saw any future for himself in agricultural work. So Smithy asked [Cecil] about us, did he? Well, he won’t have me any more for if I get out of the army alive I shan’t work on the land if I can get any where else (3 June 15). Evidently Arthur, like Ned, had been working for Gerald Smith at Great Bealings Hall farm in 1914, and not enjoying it. Meanwhile he kept his lively interest in the progress of the war (What do you think of the Huns sinking the Lusitania? If Italy and USA don’t start on Germany now they never will I don’t think [10 May 15]). Arthur wrote movingly on 1 April of a draft of soldiers departing from Felixstowe station. We were up a good time this morn, 3.45, on parade at 4.00. We had to go to the station as there was 4 or 5 hundred went away to the front. We had to keep the crowd back until they got into the train, there were hundreds went to see them off, even at that early hour. It did seem sad, mother, to see those fine young men saying goodbye to their friends, both knowing that they may never see the homeland again. The bands played to cheer them up but even they (the bands) seemed quite mournful, they played Auld Lang Syne as the train steamed off. I was glad when it was over, it made me feel bad to see the women crying, they were sent off early so that there shouldn’t be so many people there. All too soon it was his turn to go. Expecting that it would not be until November, on 8 July he wrote to say there was a medical inspection for everybody on Monday. I am still in Category A, and you will be surprised to learn that I am warned for another draft. We are going sometime within a fortnight, 500 of us. Don’t you worry mother, and don’t you try to stop me from going, please. If they hadn’t have warned me for it I should have volunteered, as I am fed up with Felixstowe, and have been fed up with this ever since I left Dolly at Brighton… Mother dear, you mustn’t worry [about] me if I never come back, I am not afraid to die, we must not all stop at home. If we don’t go and fight the Germans out there we shall have to do it here. He anticipated that they would get passes before they went: I must go to Brighton, you wouldn’t mind if I didn’t come home at all would you, as it isn’t long since I saw you. He certainly went to Brighton and perhaps not to Grundisburgh. After disappointed expectations that he would be joining George in the 7th Battalion, doubts about whether they were bound for France or the Dardanelles, and two week-long delays, Arthur finally embarked for France and the 1st Suffolks on 27 July 1915. Ironically, this was a full month before his original 9th battalion, from which he had been transferred as unfit for overseas service, were sent to France. Perhaps deterred by the threat of censorship, Arthur left a blank where he might have named the port they left from, but almost certainly it was Southampton. The “King Edward” entered the River Seine at Le Havre and sailed upstream to Rouen, where he (and the censor!) was relaxed enough about censorship not only to name the French city but to name it on a picture postcard of Rouen cathedral. The crossing lasted 15 hours. At Southampton he had met up with Alf Quinton from Grundisburgh who from Rouen went to the 2nd battalion and was killed at Ypres in March 1916. Arthur’s first impressions of his new situation were good. In three of his first letters he stressed that he liked being in France (a pretty place, prettier than England 31 July 15) better than Felixstowe (a judgment, not surprisingly, that he later reversed). The story of Arthur’s service abroad is best indicated first in outline because it was by no means straightforward. Although he was assigned to join the 1st battalion, after arriving at Rouen on 28 July he was sent to C Company, 4th (Territorial Force) battalion, probably located in areas north of Béthune, where he was engaged from about 7 August in trenching and tree-felling. On about 22 September he joined B Company 1st battalion and moved with them to the area of the battle of Loos, reaching Vermelles on 30 September just as Ned’s 9th battalion was being withdrawn. There he experienced life in the front-line trenches, but after about a week the 1st battalion was taken out of the line and by 18 October was in barracks in Béthune. Three days later, having received movement orders “of a totally unexpected nature” (Murphy p. 129), the 1st battalion boarded a train at Fouquereuil (SW of Béthune), arrived at Marseilles on 24th, embarked in the Cunard ss “Ivernia” and disembarked on 30 October in Alexandria. 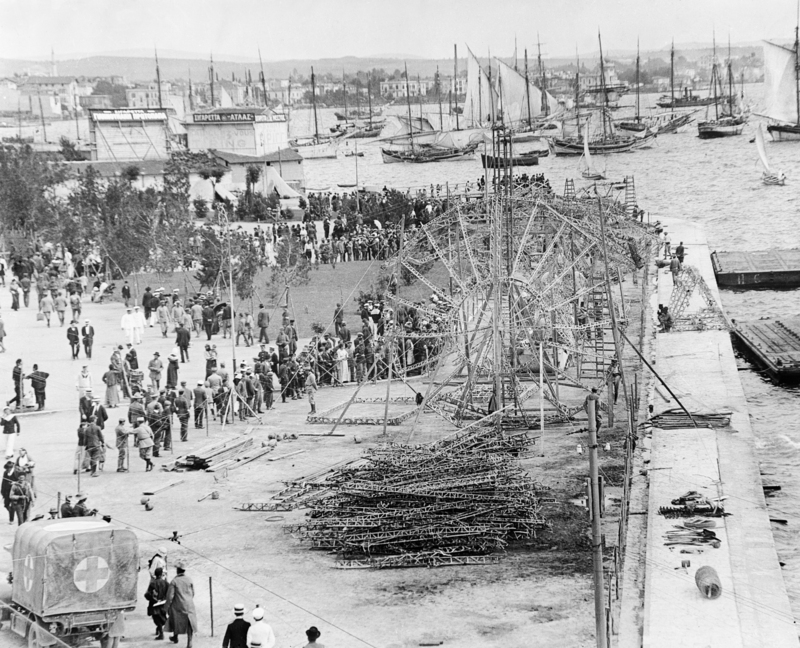 The battalion moved once, to near Abu Qir (still on the coast, to the east of Alexandria; Aboukir Bay was the location of Nelson’s Battle of the Nile) on 10 November, but on 23 November they left the heat of Egypt aboard His Majesty’s Australian Transport “Anchises”, in peacetime a vessel of the Ocean Steamship Co, and arrived four days later at Salonika. Arthur remained at Salonika for five months until on the night of 2-3 May 1916 he suffered an accidental injury, as a result of which he was invalided out on the Hospital Ship “Essequibo” to St John’s Military Hospital at Sliema in Malta, where he was admitted on 23 May. He arrived back in England in late June, probably at Southampton. 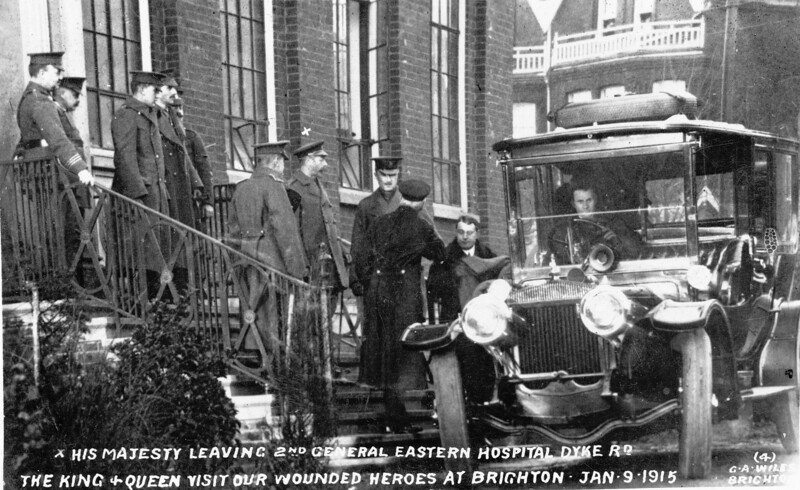 From the Clearing Hospital at Eastleigh he was transferred to the 2nd Eastern General Hospital in Brighton. The last letter we have is from there dated 6 July 1916; he had had surgery on his ear the previous day, and was awaiting a visit from Dolly. The 4th Battalion Suffolk Regt was, like the 1st, in existence before the war, but as a Territorial Force unit its personnel were not obliged to serve overseas. A year into the war by the time Arthur joined it, the battalion was integrated fully into the BEF ─ since December 1914 it had served in the front line ─ except that its postal address (but not Murphy’s History of the Suffolks) describes it as an Entrenching Battalion. Certainly Arthur was engaged in building reserve trenches behind the line when he wrote his first letter on 8 August (I haven’t forgotten it’s Hilda’s birthday). They were living in farm buildings, food was reasonable, and he did not find the work onerous but English cigarettes were hard to get. He had time to notice a little of French life (They are harvesting out here, girls and women the same as men and boys, they load the corn and pitch it too, it looks rather funny ─ Ned also remarked on the strange sight of women working in the fields) but he also reflected on how his ideas and plans had changed: It will be nice when the war is over and we can all come home again won’t it? I had thought of getting a place away from home, as I thought I shouldn’t like such a quiet life after this, but I shall keep at home again the same as before. It might sound as if his relationship with Dolly was cooling ─ the saying is quite true that “a boy’s best friend is his mother”, also “there’s no place like home” ─ but not so, she wrote to him regularly and often (24 Aug 15). By the end of August he had moved to a forested area where they cut and carted timber to a railway for use in finishing the trenches they had dug. They were under canvas with little water for drinking or washing and nothing to spend money on. He was glad to get back to entrenching on 5 September, and felt cheerful: I don’t feel so tired as I used to at Felixstowe…I am glad you are not worrying about me mother dear, I don’t want to see you look old when I come home again. He requested the Suffolk Chronicle and Mercury but no other papers (Dolly had sent four that week, and more from Mrs Cooper), oil or vaseline for his rifle, boot polish and strong laces, and cigarettes. A week later he was in a buoyant mood, not troubled with insects … I sleep lovely and comfortable at night…She is a nice old lady at this house. He was fascinated watching German aircraft being attacked (unsuccessfully) by the British guns. But in a passage that one hopes his brothers did not read, It’s not half so bad out here as some say it is. A lot of fellows write home and say they have a hard time and not enough food, so their people and friends pity them. But don’t believe all the tales you hear, about fellows at the front. I like being here a jolly sight better than Felixstowe. He thought of his sister Hilda, and teased her: Tell the little dear I hope to find her a nice behaved little lady when I get home. When he wrote on 29 September, he had joined up about a week earlier with B Company, 1st Suffolks, the battalion that his draft from Felixstowe had been intended for. The 1st battalion was one of the two regular army battalions of the Suffolk Regiment and was in Khartoum at the outbreak of war. It immediately returned to England, and by the beginning of February 1915 the battalion was in the Ypres salient (the projection of the allied front line to the east of Ypres) where it endured “months of mud and blood” (Murphy, p. 52). Nine months later, few of the regulars would have remained ─ on 8 May alone the 1st battalion had over 400 casualties ─ but Arthur was joining a unit highly experienced in trench warfare though doubtless exhausted. This was quite different from what confronted his brothers, both of whom arrived in France as members of battalions new to the war. Almost immediately the 1st battalion was despatched to the Loos sector in the aftermath of the main battle on 25-26 September. We went within half a mile of the 9th batt, and I saw my Capt who was over me there. I wish I had seen Ned, I hope he is alright, but they have lost a lot of men. They made a charge Saturday night and got severely “cut up”. Arthur next wrote on 7 October, by when he had been in action for the first and (happily) last time. From Murphy’s account (pp. 127-9), it appears that the battalion as part temporarily of 7th Division was brought into the support trenches opposite the Hohenzollern Redoubt on the morning of 2 October, and an attack was planned on the “Little Willie” trench (part of the west face of the Redoubt) for 8.30 that evening. The direction markers for the attacking force were defined by the position of the moon and a red lamp outside the German trench. Congestion and confusion in the dark delayed the attack by five hours, “but by that time the position of the moon had of course changed considerably and the enemy, who were fully prepared, had omitted to display the usual red lamp… There was no artillery support, and the attack went awry and failed”. From a complement of about 1,000 (if full), the 1st battalion lost about 160 officers and men. Arthur wrote about his experience: I have been in the same battle as Ned … we lost 170 men in half an hour. We were in those trenches a week, without a wash or shave or a rest. I was very far from being comfortable, but I thank God I got off with my life. I shall have a rare tale to tell when I get home. We are now 20 miles from those trenches and I wish we were 20,000,000. We are going to have a few days rest and then get made up to our strength, and go and have another cut at them Germans. They are devils and they are not short of ammunition or shells. They let us have plenty last Saturday night (2 October) or early Sunday morn. One fellow had 7 wounds. We were going to get in their trench and bayonet them but we couldn’t get through their wire entanglements. 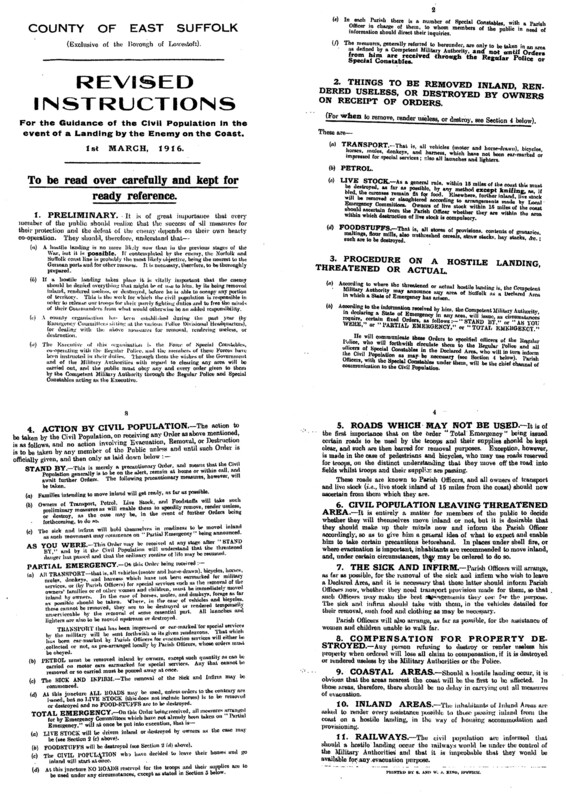 But in the same letter he returned to personal matters and reported that Dolly’s people are moving to Hassocks a few miles from B’ton on account of her mother’s health, and if it suits her father they are going to stop for good. On 14 October Arthur was still at the village (Perriere according to Murphy) resting and … having fairly an easy time, but I dare say we shall move off again shortly. Indeed they did, but not back to the trenches. By the 18th they were in Béthune, but the previous day he was charged with “Using obscene language to an NCO” for which he received three days Field Punishment No. 2 (one step up from CB to perhaps include loss of pay, no cigarettes, and arduous and unpleasant duties). His next letter was written on 31 October, when he had much more startling news than FP No.2 to give. I expect you will be anxious at not hearing, and will be surprised to hear I have left France. We are in a very hot country and are not allowed to say where. Our letters will have to go to London and then [be] forwarded to us. We are where the niggers (how normal then, unacceptable now) live and where the coconuts grow. We had a 3 days train ride in France and then 6 days across the water. We had a fairly nice voyage, only one rough day, good beds and food. We are going to fight here under a new system, not any trenches and think, out in the open. It’s wonderfully hot, we go on parade without our tunics and then are too hot to be comfortable. We don’t wear caps now, but broad sun helmets. 28 Division (comprising three brigades each having four battalions; the other battalions in 84 Brigade were 1/Welch, 2/Cheshire and 15/Northumberland Fusiliers) had arrived at Alexandria en route to Salonika. The 1st Suffolk battalion was in Egypt for just over three weeks, leaving Alexandria again on 23 November. Presumably the delay was while they awaited transport for the second leg of the journey. The interval was “wonderfully restful after the strain and turmoil of France. The climate was perfect … sea bathing … peace and quiet … blue Mediterranean …” (Murphy p. 155). The reality may have been rather different. Arthur certainly thought so. He was more impressed by the dust and sand everywhere. I don’t believe it rains more than once a year. We have a job to keep our rifles clean… It is very hot here (4 Nov 15). Remarkably (though he expressed no surprise) he had received a parcel from home the previous day ─ chocolate and cigarettes especially welcome ─ so mail was being efficiently redirected. Unfortunately We don’t get hardly enough food, and have only had 3/- in a fortnight and I owe a fellow 2/-, so will you please send me 5/-, that will leave my money at home £6.12.6 won’t it? It is very hot and we bathe in the sea every day. I have a cold in the head and if I don’t get any better will go sick (7 Nov 15). Things did not improve. I haven’t received anything more from you, I only got little parcel fortnight ago, we have had no mail come in since. I begin to feel lonely at not having any letters from home. It is still very hot, it hasn’t rained since we have been here. We have rather a rough time of it … It is such hard work getting about the desert on the sand, worse than walking on the beach … I shall be glad when I am back in civilian life again out of this. How are the boys in France? alright I hope. We have shifted our camp and are a little nearer the sea. I don’t feel quite well, my nose has bled every day this week, I really ought to go sick but am afraid of getting “[censored]” (14 Nov 15; what word could he have written that caused 2nd Lieut RD Dixon to obliterate it?). Mail arrived on 18 November, but brought bad news. I am very sorry to hear G. Martin [from Great Bealings] is killed, more so J. Smith, it is a pity about Jack, sent out about half trained, I expect his mother is fretting very much, you can tell her I sympathise with her very much, a finer young man no-one wanted. You know, mother, I begin to think myself very fortunate at being alive and well, I only hope God will continue to keep me safe, and bring me safely home again some day to the ones I love. This war is a terrible affair, I hope it will soon end, but I am afraid a lot more precious lives have got to go yet. We are still in this very hot country… Swimming and boxing were daily diversions, but Arthur seemed haunted by the thought that George’s 7th battalion was in Béthune at the same time as the 1st, but he did not know until it was too late to go in search of his brother. The next letter was written on board the “Anchises” and posted after they disembarked at Salonika on 29 November. Salonika (Thessaloniki) is a port on the northern Aegean coast of Greece. British and French troops began arriving there on 5 October 1915, and when the build-up was complete some 300,000 (nearly 500,000 according to Taylor, p. 101) were located there, including 90,000 British. Why were the Allies there at all? The Western Front was unquestionably the main theatre of the war, but once the opposing forces were locked into a stalemate of trench warfare, politicians (rather than the High Command) looked for an alternative strategy to weaken Germany and its allies and so bring the war to an end. The attack on Turkey at Gallipoli and the Dardanelles was particularly favoured by Churchill (and won Kitchener’s support) but had clearly failed by August 1915 and the last troops were evacuated a few months later. Salonika was the alternative favoured by Lloyd George. The ambition here was to prevent Germany and Austria-Hungary establishing a land connection to Turkey via Serbia and Bulgaria. In the event Bulgaria declared for the Central Powers and Serbia was defeated in attacks from Austria-Hungary and Bulgaria in early October 1915. Greece was officially neutral but the pro-Allies prime minister was forced out in the same month and the new government generally shared King Constantine’s pro-German sympathies. The Allied forces were thus the uninvited guests of an unhelpful host, and the purpose of the mission ─ to prevent the fall of Serbia ─ was already lost. The British view, Lloyd George dissenting, was that a presence in Salonika was now pointless. The French were for various reasons intent on remaining, and in order not to weaken the French government the British government also decided to stay. Not until September 1918 did the British army in the Balkans make any meaningful contribution to the war. Meanwhile Arthur and his fellow-soldiers dug trench defences to protect Salonika from an attack that no country intended to make. “The Germans rightly called Salonika ‘their largest internment camp’ ─ half a million Allied soldiers locked up without even the trouble of taking them prisoner” (Taylor, p 101; Edmonds, Short History, has the same scathing assessment by Germany, p. 124). Arthur’s mood was more cheerful once on the “Anchises” and away from Egypt. We live like gents… We have plenty of good food on board ship, we live the best now that I have done since I left you except when billeted at Brighton… We sleep in hammocks on here, and very comfortable they are too, like a feather bed. A big ship like this one … is a very fine thing, like a moving hotel. I spend a lot of my time playing cards, rather a nice pastime, but I feel inclined to gamble at times (26 Nov 15). Was this the foolishness through which he lost all his money as he was leaving Shoreham? (20 March 15). On the 25th he celebrated his 19th birthday, perhaps unaware that the ship was steering a zigzag course “on account of the presence of hostile submarines” (Murphy, p 155). The main shock in fact came from the weather ─ from almost unbearably hot in Egypt to a snow blizzard on arrival at Salonika. Now we are walking about with our overcoats on and collars turned up and shivering with cold. I can do with my gloves now please. The battalion disembarked on 29 November and marched through Salonika in the intense cold and lying snow to the village of Lembet where they dug in. They did so lacking adequate maps, knowledge of the country, information on the military situation, and shrouded in very thick mist. “For aught the battalion knew they might have been liable to attack by Bulgarians, Germans, Austrians or Greeks” (Murphy pp. 156-7). Surviving letters from Salonika are generally short in length and few in number: two in December, two in January, one in February, three in March, three in April. Undoubtedly some letters to and from England went missing, and it must have been a disincentive to write knowing that your letter might not arrive. It does seem that Arthur began to feel neglected and depressed. 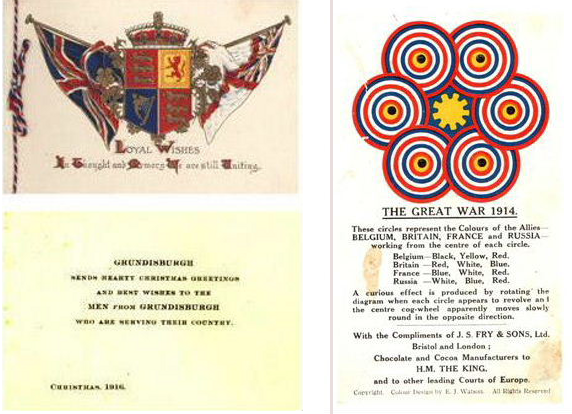 During these five months he sent six Field Service Post Cards (three with the message “I have received no letter from you …”) ─ such cards would normally be sent by troops just out of the front line too exhausted or without materials to write their own card or letter. On 12 December he wrote to say that he had found Peter Harris in the East Surrey Regt. (poor old Peter he looks bad and thinner) and Joe Leggett in the Royal Fusiliers (looks fat and well and was very pleased to see me … he gave me a nice piece of cake his mother sent … He said I was the first one he had met that he knew since he had been in the Army). He mentioned that he was writing with the fountain pen Dolly had sent for his birthday. His only mention of military activity was a postscript: We are 60 miles from the fighting. This is probably a reference to an encounter between four Allied Divisions sent into Bulgaria to protect the Salonika landings but driven back over the border into Greece on 6 December. By the date of the next letter, 22 December, 84 Brigade had (according to Murphy) been on the move, seeking more defensible positions. The 1st Suffolks eventually occupied a hill above the village of Aivatli where the battalion was to remain until May 1916. Digging trenches was difficult due to the rocky terrain. Arthur’s only reference to the move out from Lembet was 4 days rest with a chafed foot (from a lot of hard marching, I am still attending the doctor). The weather was wet, but his mood was more cheerful. We are encamped among mountains, very pretty scenery too. He had had a letter, cigarettes (hadn’t had a smoke for a week) and papers from home, and letters from Mrs Cooper and Dolly. He hoped George would be well again soon, but news of Ned’s death had still not yet reached him when he wrote next, on 1 January 1916. By then he had had two more letters and a parcel which took six weeks to arrive, plus a parcel from Mrs Taylor on behalf of the village committee and a letter from Mr Thompson at the Chapel. Dolly and Mrs C were still writing every week. Even the weather was fine and dry. In all, Greece is a very pretty country, but I long for old England, and if ever I live to return, I hope never to leave the old shores again. 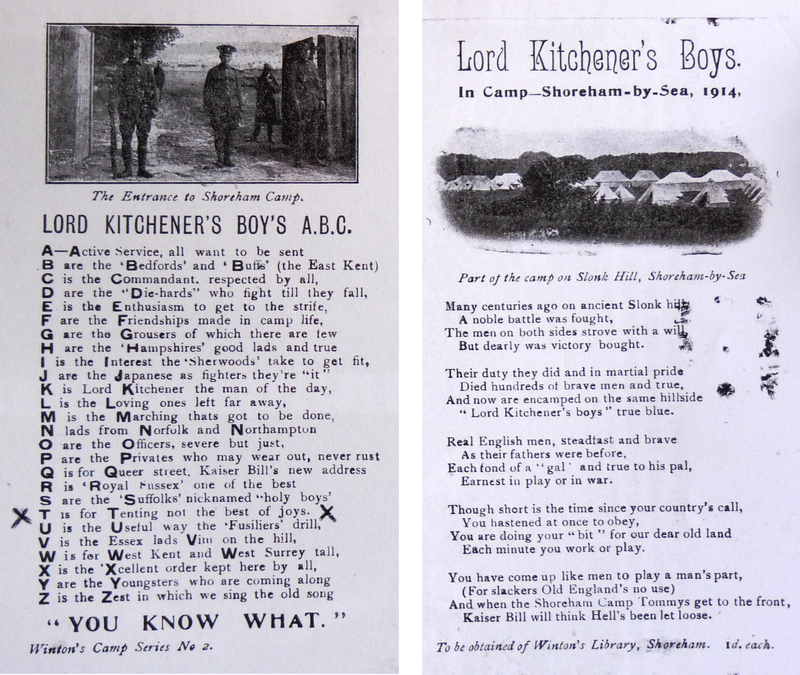 On 9 January he expressed something of the tedium which must have started to take effect: It is rather a dull life we are having now, not allowed to leave camp, but it would be all the same if we were, as there is a fine specimen of a village close by, the streets remind me of the trenches in France, and the general condition of this “city” is about like a farmyard in winter. Salonika is not bad though, it’s nearly as good as Woodbridge, only the streets are not so level. We are able to buy sweets, chocolate, figs, nuts, candles, bread, and Greek fags from native hawkers, and they will rob us first chance they get if you are not sharp. They are not allowed in our camp but on the hills round about. The next letter we have is dated 14 February (with three Field Service Post Cards sent after 9 January suggesting this was the first letter since then) and was written in some anguish. My Dear Mother and all, I haven’t heard from you now for over a month, why haven’t you written mother? Are you ill? The last letter I received from you was dated Dec 28th, two or three days after I saw in a paper (Mercury) that poor Ned was killed on Dec 19th. I know you must be very upset about it, but I hope you will write to me again as soon as possible, if you can’t write, Cecil or father ought to. I had a letter from George dated Jan 5th, he said he heard from you that morning and supposed all were well. I am going to write to you every week until I hear again, I should have written before, only I had been expecting a letter from you. Everything goes on the same here, we have not been in action here yet, I am quite well, I am very anxious to hear from you, please write soon, I hope there is nothing very wrong, I will close, with love and best wishes to all. This letter is at first sight puzzling. Arthur knew that letters could be delayed or lost but he had been waiting to hear from Grundisburgh before writing home, even though it seems that this was his first since learning of Ned’s death. George wrote a letter of condolence to his mother on 1 January so Arthur would have learned from George as well as from the Mercury of their loss. 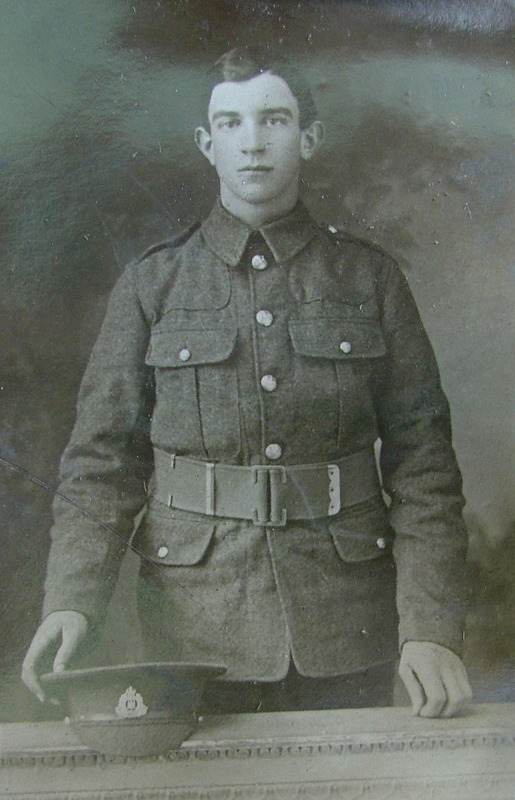 Knowing that Arthur was an emotional young man who did not make friends easily and was coping with deafness, we may guess that the death of his eldest brother with whom he had spent six months in the 9th battalion hit him very hard. Guessing again, the almost angry tone of this letter concealed his need to share his grief and find comfort from his family. Things looked better on 2 March. I hardly know how to thank you for two nice parcels I have received, one yesterday and the other today, one dated 26th and the other 31st of January… How nice the memorial card of Ned is, tears came in my eyes when I read it. I am glad you have taken the sad news so well mother, the poor boy has done his duty well and now rests in peace. I hope you won’t let Cecil enlist until he is of age. He would be sorry after, the life is too rough for one so young… We are still at the same place under canvas, and work as usual but have Sunday afternoons to ourselves… The weather has been wet lately, it has rained for two days and rains now… I am feeling much better now than what I did last week, I had a bad cold. It is not hard to imagine how dreary wet Sunday afternoons in a tent would be, confined to the encampment but nowhere else to go anyway, for month after month. Happily, I hear from Dolly and Mrs C every week. He had not seen either of them for nearly eight months but they stayed loyal and supportive, although Mrs Cooper had her own son on active service to worry about. Rfn AG Cooper of the London Irish Rifles was killed in Flanders in June 1917. Lice and Germans, the one present the other absent, were Arthur’s themes when he wrote on 10 March. Do send another box of that ointment that kills lice. I should like you to send a box every fortnight if you can please. I used some of it the night I received it and I haven’t felt a louse since. I have found some dead though. That ointment is worth 5/- a box, but the powder for “Vermin in the Trenches” is no good, it upsets the lice and makes them thirsty and they bite more… I haven’t much news, the Germans haven’t come yet, not on the land anyway. They are afraid, but still they are inquisitive, as they send an aeroplane sometimes. But even him up three miles doesn’t have a very comfortable time of it. He gets plenty of shells from good British guns, and they will get still more if they come here by land. But I don’t believe they will ever come. Indeed, the Bulgarians were content to sit defensively on the Greek border, and German incursions were nominal bombing raids from the air. No mother, the Zeppelins didn’t drop any bombs near our camp when they came the first time, neither did the Aeroplanes that came early last Monday morning. They dropped bombs on Salonika and the French camp but didn’t do much damage, and guns drove them off at daybreak and they brought 4 down later on. They frightened these old Greeks in the village, they say “Germans no good” (1 April 16). Arthur was reluctant to antagonise the censor by saying too much about the defensive works they had constructed, other than doubting that they would ever be attacked and being certain that they could not be over-run. Meanwhile, I have had six days rest with my right big toe, the nail came nearly off and then grew in, the doctor pulled it off and a new one is growing on. The batt. has been out for 5 days route marching but I didn’t go, I stayed at the Camp. I am glad I was not well enough to go, as they had a hard time of it… These were brigade exercises now that the construction work was completed and the weather improved. Three weeks later Arthur received a parcel from home, and I receive papers and letter from Dolly every week, this week I received a book too. On 2 May Arthur gave almost his only description of what Salonika or northern Greece looked like ─ the hills and valleys are prettier now as the trees and bushes are in full bloom. There is a very peculiar bush here, the thorns are like fish-hooks ─ and he had been to see Joe Leggett again (Peter Harris was unfortunately at the baths). But the following night he suffered an accidental injury. He described what happened two days later, on 5 May. I accidentally ran my mate’s bayonet through my left big toe, while going to relieve the sentries on patrol at 1 o’clock last Monday morning. We had to cross a trench and it was very dark, my mate slipped and I was jumping over at the same time and caught his bayonet. I can’t really say how it was done as it was pitch dark. The bayonet went in the top of my boot, through the joint of my big toe, and about an inch into the sole. Judging by the direction it went in my toe, it went through the bone as well. But don’t worry mother dear, it’s not very bad, most likely by the time you receive this I shall be back with the Regt. I am very comfortable in the 29th Gen[eral] Hos[pital]… It ached very much at first but it’s not painful now. I expect they will let me get up on Monday. Arthur seemed determined to make light of what had happened, though he did reveal that he had been to a Field Hospital and the 25th before being taken to the 29th, where only the worst cases come. But he added four lines to which the censor took exception though the word ‘Zeppelin’ is still legible, and the postscript The Zeppelin was brought down, it is in today’s “Balkan News” escaped the redacting pencil. What did he add regarding the Zeppelin (which in any case could scarcely have been of interest to his mother)? Probably that the craft was LZ85 and had been shot down by fire from HMS Agamemnon, the last of the Royal Navy’s pre-Dreadnought battleships which was evidently in Salonika harbour. Even so, we may guess that the censor was mainly looking to interrupt the tedium of life in Salonika. That tedium was shortly to be interrupted for everyone. Within a few days the brigade left its encampment and moved into the Struma valley where, unprotected from the summer sun and mosquitos (Murphy p. 159), the troops were hit very hard by malaria. “In many cases whole battalions were reduced in a few days to a strength of perhaps fifty effectives” (from a nominal complement of 1,000). For Arthur the prospects were very different. He wrote on 23 May: I have been moved from Salonika to Malta and am in the above hospital [St John’s Military Hospital]. I came on the Hospital Ship Essequibo. I don’t know what they intend doing to my ear, anyway I shan’t allow them to operate. We had a very nice journey, we left Salonika at 5 o’clock Saturday morning, and arrived here Monday at 11 o’clock, and came off the ship up to here today. Malta is a very nice place, much better than I thought it was. We do not know what other letters he may have sent which did not arrive or were not kept, but it is remarkable that he says nothing at all about his foot. On the face of it that was why he had been evacuated ─ surely not his deafness, unless while he was in hospital in Salonika it was investigated again and surgery proposed that he was privately determined to resist. Another possibility is that cases of malaria were already filling the beds in Salonika, where in the campaign as a whole no less than 55 per cent of the 9,717 British deaths were due to disease and accidents, the unhealthiest theatre of the war. But other evidence suggests it was his deafness that was deemed to need treatment at home. Arthur received two letters from George and replied on 10 June. This is the best place I have been at yet. We can have passes and go out every evening if we like, and are paid 2/- a week. I have been marked for England a fortnight now. I don’t know when I sail, there are several here marked for England. I didn’t like being at Felixstowe much either, but I soon found out it was better than France. The letter gives no indication of why he was to return home, but implies that the foot injury was no impediment to his going out in the evening. Probably he had been lucky and it was a flesh wound only. At home, because of the delay to letters no-one knew what was happening to him. George wrote to Cecil on 16 June, obviously before Arthur’s of the 10th arrived, to say “I am afraid Arthur has been sent back to the regiment, or he would have written again before now”. Etta wrote to Arthur at Malta on 12 June saying I have had only one letter from you at Malta up to the present (ie his letter of 23 May). But she expresses no surprise that the letter is only about deafness. I am wondering how you are getting on. Have you had anything done to your ear? George thinks it don’t ought to be interfered with. He says they can’t do you any good, and I think he is right perhaps, I hardly know what to say for the best. I wish they would send you home. By the time her letter reached Malta her wish had been granted and Arthur was on his way home. The letter was returned to Grundisburgh, where it was not opened ─ why would it be? ─ but not thrown away either. Arthur arrived at the Clearing Hospital, Eastleigh, on 26 June and moved to 2nd Eastern General Hospital (a military hospital) in Brighton four days later. He wrote the last in this collection of surviving letters to his mother on 6 July 1916. I was operated on yesterday at 11 o’clock, they removed something from my ear and have sent it away to be examined. It was not a bad operation and I am not in pain now, only a slight headache. I don’t think I shall be in bed many days. I think you were very much mistaken if you thought they would discharge me if I refused an operation. I guess I should have been in France again within a fortnight. I wasn’t anxious to have an operation, but I didn’t want to get across the water again just yet. I stand a better chance of getting my discharge now than I did before. At the least I hope to get marked permanent home service. If I had refused to let the doctor do anything I should have been sent to Felixstowe at once, and most likely my furlough would have been stopped. He (Captain Hutchison) is a very skilful ear doctor, so I didn’t mind him operating. Dolly’s father knows him and he told me to have it done. Dolly is coming to see me Sunday afternoon. Had he refused to have the surgery, as he did in March 1915, he would presumably have been denied a discharge and been liable for home service or even active service abroad as in 1915. Had the operation been a success and restored his hearing he would ─ again presumably ─ have been returned to active service abroad. If the operation failed he would have been at best fit for home service or might expect to be discharged from the army. It was the last of these. The Medical Board met on 14 July and found him “no longer physically fit for War Service. Causes: Mastoid Suppuration and Deafness”, and he was sent home with a “£1 advance and a suit of plain clothes”. There was no mention here of his injured toe, though his disability (whether deafness or the toe is lost from doc. 982 of his Service Record) was judged in a communication to the Ministry of Pensions to have been aggravated by active service overseas, and he was awarded a pension of £1 a week for 20 weeks. The sequence of letters from Arthur to his mother ended abruptly in July 1916 when he returned to Grundisburgh after 1 year and 316 days army service. He had been overseas for just two weeks short of a year. During that time it appears that Dolly wrote to him regularly, and in his last letter he was awaiting her visit to the hospital. There are no clues as to what may have transpired that Sunday afternoon, but nothing further is known of her.